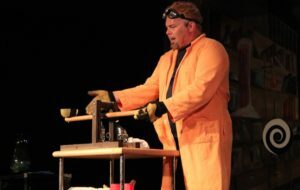 Doktor Kaboom is an over-the-top German physicist with a passion for science that knows no bounds. 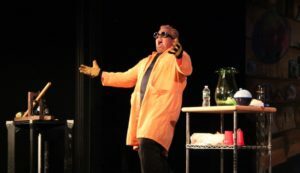 Sporting chrome goggles, an orange lab coat, motorcycle boots, and wicked cool hair, Doktor Kaboom travels the world, thrilling adults and children alike with an explosive comedic style and an improvisational skill that promises no two shows will ever be the same. 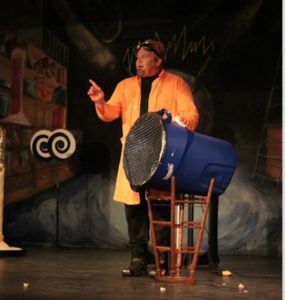 His character-driven comedy will entertain audiences of every age. 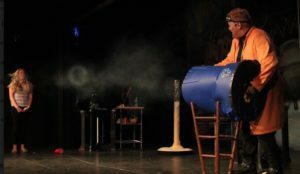 Nothing says science like KABOOM! Sponsored in part by the Joan Rothenberg Family Foundation. David Epley grew up expecting to be a research physicist. Then a biomedical engineer. Then a mathematician, an astrophysicist, a chemical engineer, a marine biologist. So, of course, he became an actor. 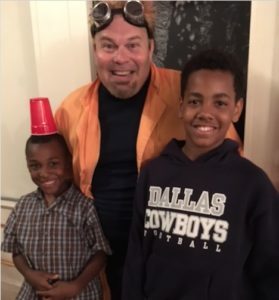 For almost 30 years David has written, directed, and performed original comedy shows throughout the US, and around the world. In 2006, David decided to bring science, his first passion, back into his life. Blending science and theatre has been a dream come true, opened multiple doors, and led to the most fulfilling work of his life. Teaching, inspiring, and empowering the minds of our youth, and reminding their parents to be an active part of the equation. David is a veteran of the US Army, and a former Firefighter and EMT. He calls Seattle home, where he lives and loves with his wife and their two wonderful daughters.